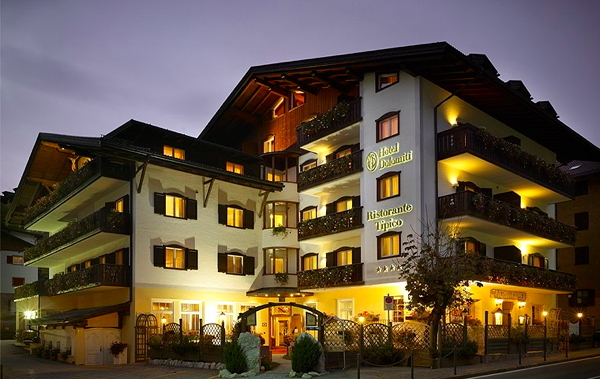 Located in the center of Moena in Fassa Valley in the province of Trento, The 4 Stars Hotel Dolomiti, is a refined and cozy environment. Everything has to have it's own balance so that spending Your vacation here can provide all the calm and comfort You need, leaving behind the everyday life noises. Our home with all the facilities and warm environments gives the well being and intimacy that young couples, families, children and youth need, satisfying also the leisure desire! COMING FROM SOUTH: From Verona get on the Brennero A22 highway. Follow this highway and get of at Egna-Ora exit, located about 30 Km after Trento and 20 Km before Bolzano. COMING FROM NORTH: From Brennero stay on the highway till You reach Bolzano, continue for 20 Km and get the Egna-Ora exit. Moena is 40 Km distance after taking the Egna-Ora exit on the highway (40 min or so). Get the Dolomiti 48 SS (state road) and follow directions for Cavalese - Val di Fiemme - Val di Fassa. The panoramic road crosses the mountain villages of Fontanefredde, San Lugano. From there Your enter in the "Valle di Fiemme" territory till You reach Predazzo. Here at the rotary follow directions for Moena - Val di Fassa. In 10 minutes You arrive at Your destination. Once You get to Moena, keep the main road till You reach the traffic light just before the main square, then on the left side of the road You'll see our Hotel Dolomiti... YOU ARRIVED! ALTERNATE ROUTE: PANORAMIC In the case You should find roadblocks at Egna-Ora exit (festivity days and high season weekends) or if You just want to enjoy a magnificent view, we advise to get the BOLZANO NORD (north) exit and follow directions for Val d'Ega - Passo Costalunga. The very characteristic road, crosses the villages of Ponte Nova and Nova Levante; about 10 km and You reach Passo Costalunga, passing the enchanting Carezza lake. From there for 20 Km You'll cross Vigo di Fassa and then Soraga villages and then You get to Moena. NOT RECOMMENDED IN WINTER POSSIBLE SNOW OR ICE ON THE ROAD. REACHING US BY TRAIN Get off at the train station in TRENTO. Next to the train station, on the right You will find the bus station. Every 2 hours ( 9:00 - 11:00 - 13:00 - 15:00 - 17:00 - 19:00) there is a "Atesina" Company bus leaving for Moena. You can get the ticket at the ticket-office in the bus station or directly on the bus. It takes about 2 hours to get from Trento to Moena, the bus stops in all "Val di Fiemme" villages along the road. Once in Moena, our hotel is quite close, just 50 meters from the bus station. Please give us a call, and we will be right there to help You with Your luggage.